The broadcasters' Thursday coverage was depressed by full slate of preseason NFL pre-emptions, so all originals were down double digits week-to-week, including finales for Motive and Hollywood Game Night. A&E's chart-topper Duck Dynasty (4.1) took a 10%ish drop for the second straight week since its premiere. Only about five more of these and it'll no longer be the top entertainment series on the air right now! This was not a big summer for my timeslot metric called True Strength, as most of my energy has gone toward creating the new historical posts. I'm not going to do a full-length explanation of every single facet of the formula this year as I have the last two, because this year there was no major overhaul. I'm just going to go over the few substantial changes, and that can serve as an addendum to all the posts I wrote last year. On another dull broadcast Tuesday, the most notable ratings came on cable, where ABC Family's Pretty Little Liars (1.4) had its biggest rating this summer and TNT's Rizzoli & Isles (1.4) tied the summer premiere's season high. As a one-time only event, I'm bringing my regular season True Power Rankings system to the summer shows to examine the uncertainties among the marginal broadcast shows. Since there's so much uncertainty about how much real estate the networks actually want to program during the summer, I'm consistently going to be very wishy-washy, but I still thought the numbers might be of interest. With Best Case/Worst Case season on the horizon, this will be the last formal use of "True2" before I introduce a few relatively minor tweaks to the number for 2013-14 by the end of this week. The True2/A18-49 averages use the same Power Rankings rule used in the regular season posts: they average the last one third of episodes aired through last Sunday, August 25. The finale of NBC bubble show Get Out Alive got back to fairly normal levels following a bad result last week. And the move of ABC's Mistresses to the 9/8c hour took it up a tenth; Shark Tank proved a much better lead-in than Castle. Preseason NFL dominated broadcast TV on Friday and Sunday, with the 2.3 average on Friday for Seahawks/Packers on CBS particularly impressive, but it lost out to a nice showing from ABC's NASCAR on Saturday (it was up a tick from last year's late-August race). AMC saw Saturday's Hell on Wheels (0.33) finally take the 18-49 dip that it seemed like it should've taken last week when it dropped a ton of viewers. But HoW is far from the network's biggest concern; week three of Low Winter Sun (0.42) dropped again and is now retaining 17% of its Breaking Bad (2.53) lead-in. It's pretty clear now that this show is a disaster, and I think AMC ought to strongly consider moving BB aftershow Talking Bad (which actually very narrowly built from LWS at a 0.43) to the immediate post-BB slot. The week's top program was Sunday's Video Music Awards (5.2) on MTV, which nearly doubled last year's ill-scheduled 2.8 rating on a Thursday. The 2.8 in 2012, not this rating, was the real outlier here; the show actually got a 6.2 two years ago. In the spring I did season-by-season recaps of the three old years added to the fold: 2003-04, 2004-05 and 2005-06. I liked those so much that I've decided to do them for every single year of the decade across which A18-49+ era is available. The summer began with 2012-13, we've looped back to 2006-07, 2007-08, 2008-09, 2009-10, 2010-11 and today... we wrap up with 2011-12. Check out the list of all 16 A18-49+ recaps at the bottom of this page! This time we're breaking original series programming apart by time of day, looking at the shift of primetime ratings strength from the 10:00 hour into the 8:00 hour. Since I just gave away what is pretty much the only storyline, this post will just be the table with all the years together. I recommend my earlier post about the 10:00 hour for much more in-depth examination, but I didn't want to regurgitate all of that in this post. For some reason, ABC's Motive had its best rating since before the NBA Finals. I still don't think it gets renewed right now, as they have plenty of low-1's performers to choose from, but it at least makes next week's two-hour finale a little more interesting. This week, the series finale of Top 10 of the Last 10 looks at... series finales, plus the seasons that accompany them. How far did some of the one-time megahits fall by the end? I don't have a particular series length in mind when I say "veteran" final seasons, but suffice to say I'm using that word to weed out first-year cancellations like Coupling and Rob. Fox's MasterChef was broadcast's #1 program for the second straight week, and it grew to its own best rating since June. Week two of A&E's phenomenon Duck Dynasty (4.5) dropped about 10% but should comfortably top the week again. It launched newbie Modern Dads (1.9) at 10:30. The America's Got Talent slump rolled on; it's now down 0.6 points in the last four weeks. So You Think You Can Dance was also down to a low for a third straight week. The night's good news: a new season high from Extreme Weight Loss. If you're into repeat tea leaf reading, it was not a good start for what will be ABC's Friday fall lineup, as The Neighbors hung a pretty terrible number and brought Shark Tank down to easily its worst repeat rating of the summer. The move to Friday was of no help to the CDub's Perfect Score, but America's Next Top Model gained back a tenth in week three. Week two of Hell on Wheels on AMC Saturday dropped a big chunk in total viewers (2.49m -> 1.88m) but was strangely steady in 18-49 (0.48 -> 0.48). ABC's Mistresses came back after two weeks off and without any help from The Bachelorette, and the results were predictably pretty ugly. Another of the summer's many marginal low-1's shows, NBC's Get Out Alive, also had a really bad evening for less clear reasons. Maybe the arrival of preseason football on ESPN (2.1) hurt? After weeks and weeks of oscillating between a fairly anemic 1.0 and 1.1, ABC's Whodunnit? took a surprisingly large upswing to a new series high 1.4 in its finale. It would be hard to completely count out this show's prospects for a season two, given that almost everything on the network this summer has been in the 1.0 to 1.2 range. Week two of last week's big story Breaking Bad (2.4) took what is historically a relatively typical week two downswing for this show, shedding a half point from last week. It narrowly held off the finale of True Blood (2.3) to win the night, and it may have a shot to bounce back next week when Blood is out of the mix. But the more important AMC story was the massive meltdown of Breaking Bad's lead-out, newbie Low Winter Sun (0.5), which shed about half of its already underwhelming premiere number. I don't see anything hugely compelling between now and the offical start of season two of The Question on September 9 (sorry FXX launch), so the game is taking about a four-week hiatus till then. The winner of the 12-game summer season is Igwell Predicts, who won every single July/August game after a 2-5 start. Congrats! Everyone else, better luck in the regular season, and please mark your calendar for September 9 when it's back on! The tangled web that is local NFL preseason pre-emptions descended on Thursday primetime starting on August 8, and it took at least a tenth out of nearly every program. Most programs bounced back last night against week two of the preseason. This week, it's the top ten Friday scripted shows. I sure hope you like Ghost Whisperer and Numb3rs! These averages are kept to the Friday episodes only; in other words, non-Friday episodes that may have been part of these seasons are not included. In the Notes I'll include some info on unscripted shows that would've made this list. Scheduling history: The Middle began at 8:30 on Wednesdays, as the second of ABC's fall 2009 Wednesday night of all new programs. Though its lead-in Hank lasted just five episodes, The Middle stayed at 8:30 (mostly leading out of Modern Family repeats) till the end of season one, then moved to the 8:00 lead-off role in season two. It spent six years there before making the move to Tuesday at 8/7c in season eight. See (who saw) how it all began: ABC didn't roll out the aforementioned all-brand new Wednesday at once. The Middle and its lead-in Hank arrived in week two of the season. The Middle was immediately the more promising of the two, pulling a 2.6 demo and building on its Hank lead-in's 2.1. Both shows took a significant drop in week two, Hank to 1.6 and The Middle to 2.1. Hank dipped south of 1.5 by episode five and was pulled from the sked, but The Middle pretty much held at that low-2's level for most of the rest of season one. It occasionally showed some promise in its early 2010 episodes, getting as high as a 2.9 on 2/10/10. The best of times: The Middle hasn't grown as significantly as its Emmy-drenched peer Modern Family, but it still had a raw numbers uptick in seasons two and three. Its strongest raw level was in the fall 2011 when it consistently settled right around a 3.0, and it got as high as a 3.2 demo on 10/26/11. On a historical-adjusted basis, season six was the best yet, as the show's raw numbers dropped just 3% year-to-year, and season seven set another new high. The worst of times: The Middle was definitely at its least valuable in season one, and the raw series low long remained the 1.7 Thanksgiving Eve airing on 11/25/09. It finally hit its first new series low since season one with a 1.6 on 5/7/14, but repeated it just once more in 2014-15 (on 12/3/14), and then only a couple more times at the very end of season seven (5/11/16 and 5/18/16). The move to Tuesday finally brought a slew of new raw lows, but it was still Middle's second-biggest season in A18-49+. Then vs. now: ABC Wednesday in 2014-15 was the network's strongest two-hour comedy block since long before the current generation came around, and at the start of it was a very good season from veteran The Middle. The network had far more year-to-year timeslot improvement with The Goldbergs at 8:30 and Black-ish at 9:30, and Modern Family of course remained the highest-rated of them all. But The Middle was quietly a big winner itself, and the wins continued into the block's second season in 2015-16. Season eight saw The Middle finally leave Wednesday night after seven seasons, but it held up well enough to create major timeslot improvement on Tuesday. The return of Duck Dynasty set a new record for a cable "nonfiction" entertainment series with its 11.8 million viewers, and it was even more impressive as a young adults draw with a 5.0 rating that nearly doubles anything else entertainment on the air right now. It's just another step in what has been an absolutely meteoric rise since debuting at a 0.8 rating less than 17 months ago! It definitely brings back memories of Jersey Shore, which went from a 0.8 premiere to its 4.7 zenith in only about 13 months. The usual late-season deterioration by America's Got Talent really picked up last night as the show dropped well below its previous season low, and it brought Camp down with it. This is a special Flashback edition of the War of 18-49 for NBC's longtime ratings monster Friends, for which I've gotten a lot of ratings requests over the years (at least by my standards). Like with most shows, I have no real 18-49 info prior to the 1999-00 season, and it's spotty even in the first couple years after that, but I figured I should get around to sharing what relatively little I do have. (If you have more than I do, let me know!) 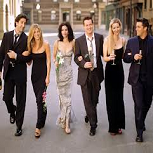 Since I have so much less context for most of the time in which Friends aired, I won't weave the epic tale that I do for other series. I'll pretty much just spit out what I have. The Climate is back for the second of three looks at the "big picture" numbers of the broadcast networks' summer! Let's take a look at the 2012-13 season (the twenty-fourth overall) of The Simpsons on Fox. It's our second of three True Top 25 check-ins this summer! We find ourselves with a clear elite tier, all of which tends to fall in the low-to-mid-2's (or mid-to-upper-2's in True2). It currently consists of Big Brother, America's Got Talent, MasterChef and Under the Dome. Then there's a huge drop-off to everything else doing mid-1's at best, led by shows like So You Think You Can Dance and American Ninja Warrior. Generally the only show that has occupied that nearly one-point gap in the middle has been The Bachelorette, which averaged a 1.98 for the season, but it got to look like an elite show this week on its finale night. The ever-struggling repeat telecasts are as usual led by The Big Bang Theory and its lead-out Two and a Half Men, with Shark Tank and the Fox cartoons pretty much making up the second tier of repeaters. (Though the toons were kicked out of their regular slots in this particular week by the Teen Choice Awards.) CBS' Monday 9:00 hour comedies have repeated OK, perhaps getting a little help from some Under the Dome pre-tune. There are really no strong drama repeaters left; only CSI even went above a 1.0 demo last week. It was much-publicized that Breaking Bad (2.9) beat all the broadcasters this week, but another crazy stat was that the 8:00 repeat of last season's finale (1.2) beat all the broadcast drama repeats! The CW brought America's Next Top Model back to the schedule even earlier than last year with a fairly encouraging two-hour premiere that was two tenths ahead of the late-August 2012 premiere. However, it fell back to earth in week two. Last year it really picked up as the regular season neared, so don't write it off just yet. Also of some note was AMC's foray into Saturday night originals with the return of Hell on Wheels on August 10, which actually narrowly increased its total viewer delivery year-to-year even in a Saturday move with 2.49 million. It had a 0.49 demo, down from the August 2012 premiere's 0.62. Still, I would think that's a pretty acceptable Saturday level if it can maintain it; the show averaged just a 0.55 on Sunday last season. CBS' Under the Dome has sprung a mini-leak in the last couple weeks, dropping a couple ticks each week. Maybe it's real, maybe it's due to ABC putting up at least a point more resistance in the 10:00 hour the last couple weeks, maybe the much-publicized Time Warner blackout is having a tiny effect. Worth keeping an eye on. The latest big-time story in Sunday cable was the return of Breaking Bad (2.9), which not only keeps growing but keeps growing faster. This number was nearly double any previous episode of the show. What really makes this story unique is not necessarily the size of the growth; believe it or not, these kinds of 100%ish growth spurts are not terribly uncommon, as Game of Thrones, True Blood and Homeland can attest. The real story is that Breaking Bad is pulling it off this late into its run. Those enormous bounces generally happen with second-season shows. The NFL came back on August 4 with the Hall of Fame game, which featured football's biggest ratings draw (the Dallas Cowboys) and handily outrated any preseason game from last season. In the broadcast entertainment world, ABC brought back Secret Millionaire, which joined the very crowded club of low-1's performers on ABC this summer. It was 20% behind last year's premiere and downticked in week two. And CBS' drama Unforgettable deteriorated a bit in weeks two and three after an already soft start. Let's take a look at the 2012-13 season (the ninth overall) of American Dad! on Fox. Let's take a look at the Summer 2013 season (the ninth overall) of The Bachelorette on ABC. The Question, Sunday 8/11/13: Will Breaking Bad Have One Last Breakout? Tonight brings the return of one of AMC's signature dramas Breaking Bad, a hotbed of critical acclaim that has also quietly become a significant ratings success in the last couple seasons (even if it's still overshadowed by network mate The Walking Dead). The hype seems bigger than ever for this show's last hurrah this summer, though it will go up against multi-pronged premium cable competition from stalwarts True Blood and Dexter. Will Breaking Bad have one last breakout? That's The Question for Sunday, August 11, 2013. This week, we're taking a look at the top ten most crowded seasonal days of the week in the last ten years. Which days of the week had the highest average for non-sports original series? Scheduling history: Every Breaking Bad episode in the first 4.5 seasons aired on Sunday at 10:00, though that changed for the final run in summer 2013; it moved to 9:00 to launch ill-fated newbie Low Winter Sun. Scheduling history: All of Moonlight's 16 episodes aired on Friday at 9/8c. The season was interrupted after 12 episodes by the WGA writer's strike, but the show returned for four post-strike episodes in spring 2008. Let's take a look at the 2012-13 season (the eighth overall) of Criminal Minds on CBS.